According to the Centers for Disease Control and Prevention, approximately one in 12 people in the United States have asthma, totaling almost 25 million people. While there’s no cure for this chronic disease, there are many ways to manage the condition, allowing you to breathe easier. At her family practice in Perrysburg, Ohio, Dr. Roberta June Guibord successfully treats and manages asthma in patients of all ages. To get relief from your symptoms, call or book an appointment online. "I felt like Dr. Guibord actually listened to my issues." "Been with the Doctor for 17 years . Can't say enough kind words about her and her staff." "Dr. Guibord spent time listening to my problems and heard my concerns." "I have seen her for a long time and she has always given me her full attention." "Wonderful knowledgeable care. Takes a personal interest in the whole patient." Asthma is a chronic inflammatory condition that affects your respiratory system, namely the ability of your bronchial passages to transfer air. The inflamed and narrowed airways that are the hallmark of asthma hamper your ability to breathe correctly in the fact of certain triggers. In addition to the inflammation, asthma also causes excess production of mucus in your airways, which further inhibits your breathing. First, it’s important to note that there’s no known cause of asthma. The medical community does, however, believe that genetics, allergies, and environment play substantial roles in the development of the condition. While this list isn’t comprehensive, it does highlight the main offenders. While some of these symptoms may be constant, most are brought on by an attack, or at least increase significantly during an attack. Long-term and Spot Medications: For long-term management, Dr. Guibord turns to daily oral medications designed to reduce the inflammation in your airways, usually with steroids. Dr. Guibord also equips you with a bronchodilator, or rescue inhaler, to help relax the muscles in your throat to loosen your airways during an attack. Trigger Avoidance: Dr. Guibord works with each patient to get to the bottom of what’s triggering their asthma, making it easier to develop a plan to avoid these triggers. Lifestyle Recommendations: Dr. Guibord works with you to develop exercise and nutrition habits that stave off asthma attacks. She may also recommend some lifestyle changes, such as quitting smoking. Each case of asthma is different, so Dr. Guibord provides a tailored plan that makes the most sense for your goals and needs. To learn more, call Dr. Guibord or book an appointment online. Dr. Guibord accepts the following insurances. If you have any questions, please call our office and one of our staff members will be happy to assist. "Overall I'm very happy with her and the office. The office staff is friendly. 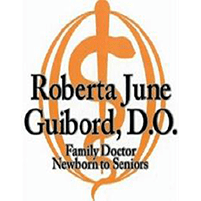 I felt like Dr. Guibord actually listened to my issues"
"Wonderful knowledgeable care. Takes a personal interest in the whole patient. Wait time is very reasonable. Office efficient and well run. Always a positive experience"
"She is a caring and professional PCP. She takes the time to look at the big picture. Her staff is efficient and caring." "Dr. Guibord is a very good doctor. I have been going to her for years. She is very caring doctor." "Dr. Guibord took the time to talk directly with me about my medical history and my existing medical issue. I really appreciated her friendly, caring bedside manner."